It's been a hectic, busy year. Most weeks, I am running in survival mode just to get to Friday because at least on the weekend I don't have to get two people out the door and dressed and functioning. I am so tired of living in that kind of survival mode. Literally, tired. A few months ago, a dear friend, Ginger, asked me to come alongside her and another friend, Carey, to be a part of With Joy Retreats as the Administrative Director. My organized, Type-A self jumped for joy - no pun intended - at the idea of being part of a weekend away for women. Most of all, I was excited to be a part of retreat that isn't going to be about social media and hashtags and meeting a million people and going to back-to-back-to-back-to-back meetings. Instead, it's going to be about resting and being and finding purpose in the resting and being. Come April, I will be off on a weekend away with a wonderful team hosting over 50 women who want just that: to rest and to be. My goal for December is to begin this ritual of rest. I want to fill my calendar with intentional times with my family and intentional times for myself. I want to be okay if there's nothing on the calendar for the weekend or if I spend the evening after a long work day sitting and resting instead of tackling a to do list. Are you looking for rest? Are you looking for intentional time to just be? Consider joining me and others here in Arizona for a weekend away. 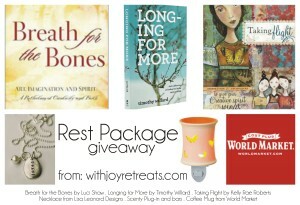 In the meantime, enter the giveaway below to give you a jump start on intentional time of rest. 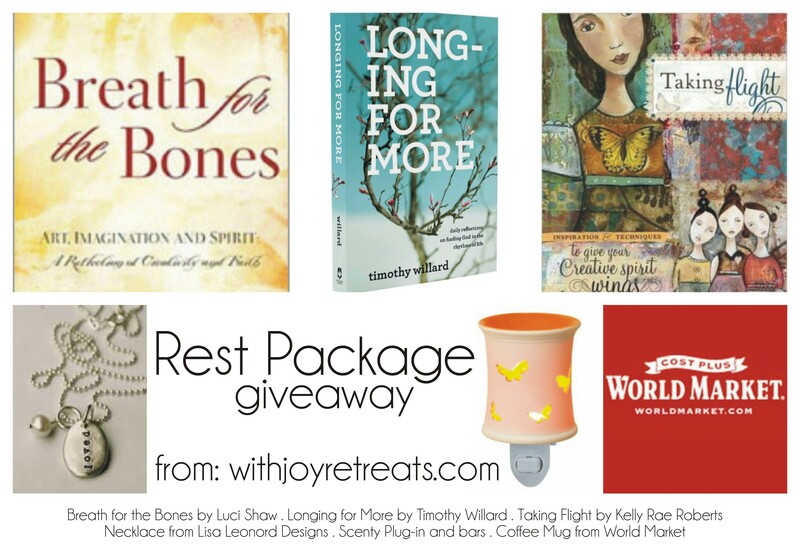 One person will win Breath for the Bones by Luci Shaw, Taking Flight by Kelly Rae Roberts, Longing for More by Tim Willard, a "You Are Loved Necklace" from Lisa Leonard, a Scenty Plug-In and Two Bars, and a mug from World Market. As we ease into this busy month of holidays, parties, socializing, gift-giving and family time, make sure to allow yourself time to rest. It can be one of the greatest gifts of all.